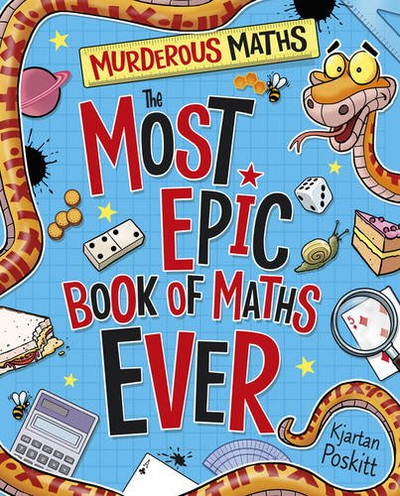 The Most EPIC Book Of MATHS EVER! Click the cover to order your copy. THE MURDEROUS MATHS OF EVERYTHING. This was done to bring it in line with the re-launch of the Murderous Maths series. Click the poster image to see a bigger version which you can print out! 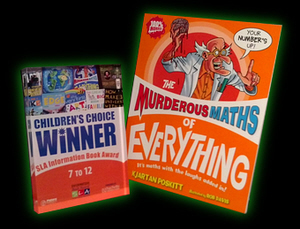 The FULL COLOUR Murderous Maths book! Previously published as "THE MURDEROUS MATHS OF EVERYTHING"
"It's still maths but with laughs added!" 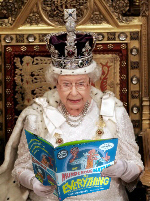 To celebrate the first 13 years of Murderous Maths, the MM Organisation is having a royal visit! ... and see how the Evil Number 1 shapes the entire universe! Don't forget to click the EXTRA links for the details that we didn't have room for in the book. How much will this new full colour book cost to make? The Murderous Pennies have the answer! Find out why we've locked the Evil Number 1 up in its own cell! The Evil Gollarks try to buy a space battleship, Professor Fiendish has a diabolical coin trick and Urgum the Axeman gets into a fight. You'll see how the ingenious Sieve of Eratosthenes finds prime numbers, and then find how prime numbers can help you pay for pizzas, and how they can stop you being eaten, and how they could make you famous for ever! Join the detective Sheerluck Holmes as he investigates triangle and square numbers, and then uncovers how the ancient Greek Pythagoras was driven to commit murder by the Evil number One! Blade Boccelli and the gang work out a plan to make Dolly Snowlip's birthday last for ever - but can they really drive around the world at 786 miles per hour? Never mind , at least you'll find out how you CAN make your birthday last twice as long! The Three Oldest Problems in the World... finally solved with some Murderous Maths! EXTRA: How to make a circle into a square - the bits we didn't have room for!. EXTRA: How to Trisect an Angle! Learn to draw the Perilous Purple Loosestrife plus other shapes just using a straight edge and compasses. You'll also find out how the ancient Greek Eratosthenes calculated the size of the Earth. EXTRA: some photos of children's classroom activities, including pictures drawn by children of flowers and eggs! Once you've got past the strange stairways and secret doors find out how to cut something in half and yet leave it in one piece, and why broken spectacles = knickers! The Pure Mathematicians show off their new conic sections invention but Professor Fiendish breaks it with his revolting bottigrubs. The mathematicians instead decide to build something very big and extremely dangerous to demonstrate the amazing cycloid curve, and you'll discover which part of a moving train always goes backwards. The great Rhun of Jephatti wants his rulers to measure different lengths with the minimum of markings. But how can these rulers help detect alien invaders? EXTRA: How a Golomb Ruler can make you famous for ever. How to play 4-dimensional Noughts and Crosses. Normally we play O's and X's (or "Tic Tac Toe")in two dimensions, but when our royal visitors accidentally collapse into one dimension, you'll discover how to play 3-d and even 4-d noughts and crosses! EXTRA: Try the 3-d O's and X's puzzle! Who has got the perfect figure - a sunflower, the nautilus sea shell or the Parthenon in Greece? Full details of how the amazing golden ratio and the strange Fibonacci series control almost everything in the natural world. Even Professor Fiendish and his soppy snogmites find a way to join in the fun! When Binkie Fogsworth builds his own organ, all the notes sound exactly the same. Luckily the colonel and the duchess help to make it more tuneful, but they discover why it's impossible for any keyboard to be exactly in tune. Warning: watch out when Binkie plays that KILLER TOP C! EXTRA: Why do some musical notes sound AWFUL together? EXTRA: How do guitar strings make different notes? Ghost potatoes, the ham sandwich theorem and why is there always a cyclone blowing somewhere on earth? This chapter will really set your brain spinning, and there's another chance to be famous for ever just by doing a little drawing! All you need to do is sort out the FOUR COLOUR MAP THEOREM! Whether it's cards, dice or vulture spit cocktails, Riverboat Lil always seems to beat Brett Shuffler! The secrets are all in Pascal's triangle, but that's not all! See how it links to an amazing Sierpinski Triangle using some super-cool chaos maths! See how your chances of winning can be described with either fractions or a %. Lil examines lots of different games ranging from the odds of different poker hands to the chances of going to jail in Monopoly. EXTRA: More details on the chances of card hands here including the Dead Man's Hand! EXTRA: The MM book DO YOU FEEL LUCKY? is devoted to dice, cards, probability and combinations. We don't use chess boards for playing chess! Instead you'll hear the story of the Cursed King, see the amazing Knights Move magic square and be dazzled by an extraordinary illusion! EXTRA: How many squares OF ALL DIFFERENT SIZES are there on a chessboard? When the Evil Gollarks land on earth, the moon and sun play a nasty trick! Check our guide to the other planets, make your own model of the solar system and find out why we're all moving at 18 miles per second. Finally we go into deep space to discover how the Evil Number 1 controls the shape of the galaxy! Finally the professor finishes with a few peculiar items of his own. and that's why they call it Murderous Maths! is reading the Murderous Maths of Everything today?